Jeff Adams (from Ashland, Missouri) designed this method of blade attachment. He writes, "The wedge can be almost any angle to custom fit any tang angle to any height person. Haft angle is easily adjusted. So far it's working well for me (cutting lawn grass)." Thanks, Jeff for sharing this with us. 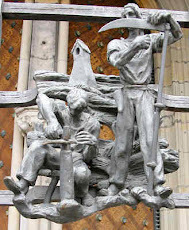 A novel way to attach a scythe blade to a wedge, and the wedge to the snath, allowing modification of tang angle, haft angle and sideways tilt. Since people vary in size and mow under various terrains with diverse kinds of plants, the scythe must be custom fit to work well, and so must the blade. If not, the scythe may be all but useless. This design should work well for fitting the blade to the snath, and is very inexpensive. 1) The snath is 1.25 inches wide at its bottom. 2) The blade's tang steepness is 10 degrees, but you desire a 27 degree angle. Before reading further, it is helpful to look at the photos. Get a block of wood 4.25 inches by 1.5 inches by 3.5 inches. (The required size will depend on angle of wedge desired and snath width.) The 1.5 inches is the fat end of the wedge. The 3.5 inches will cover the width of the snath and provide space for the clamps bolts, described below. The 4.25 inches accommodate the tang and the pivot bolt described below. I used a piece of scrap softwood lumber. Hollow out in the shape of the tang the bottom of the block just short of the thickness of the tang. (That is, a rectangle about 3.5 inches long, 1.25 inches wide and an eighth inch deep). The tang will fit in the slot, with the tang's thickness rising a small amount just above the slot. Drill a hole a little narrower than tang's knob, then with a chisel square it up to accommodate the tang’s knob. Now cut the block to a 17 degree wedge, with the thick end having the tang’s knob hole. The thin end should have some thickness too -- say about 1/4 inch. (c) clamps the wedge to the snath. Toward the front of the wedge (about 1.25 to 1.75 inches from the front of wedge) and on both sides of the wedge drill holes to accommodate two bolts. The holes are drilled about a half inch from the sides of the wedge. I used 1/4 inch diameter bolts. The distance between bolts corresponds to the distance between holes in the metal plate. The plates are 3 inches by 1/2 inch by 1/8 inch thick. Other sizes could also work. These two bolts, in conjunction with an upper metal plate ( I used two upper metal plates) and a lower metal plate, will clamp the front portion of the tang to the wedge and will also clamp the front portion of the wedge to the snath. 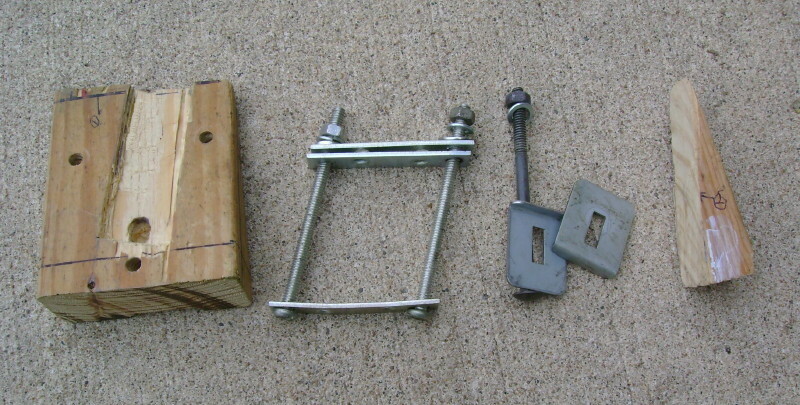 Wedges that are 1.25 inches high (or whatever the snath's depth is) are placed between one (or both) bolt(s) and snath sides to lock in haft angle. Another way to lock and strengthen the haft angle is to make a 1.25 inch wide, 4.25 inch long and about an eighth inch deep depression on the upper half of the wedge to accommodate the snath’s bottom. The angle of the depression will depend on the desired haft angle. This approach also helps lock the wedge onto the snath. I also place a piece of leather along the lower portion of tang, i.e., between the tang and the large metal washer and between the tang and the bottom metal plate. 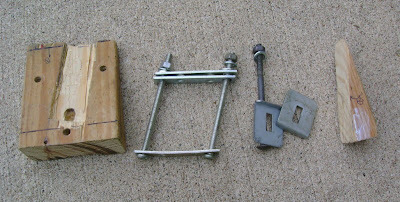 Instead of a single rear bolt, you can probably make another clamp for the rear part of the wedge in the same fashion that the clamp is made for the front portion of the wedge. 1) Use washers and lock washers with the nuts and bolts. 2) To reduce strain on bolts and wood, it helps to countersink holes to match the angles of bolt heads/nuts/plates to wood. Or use small wood wedge washers to match up the angles. 3) At first I angled the wedge slot that accommodates the tang and thus modified the haft angle. But then I realized the resulting haft angle was too acute. I was still able to pivot the wedge and fix the problem. 4) This same basic approach will likely work if you want to reduce the tang angle. The fat end of the wedge will face to the front of the snath. The narrow part the wedge would have to be a little thicker to give some strength to the pivot area. 5a) The wedge can be modified on its top surface to change the angle it makes to the ground. That is, a wedge is cut out of it to modify its angle to the snath’s bottom. 5b) The wedge can be modified on its bottom surface to change the angle the blade makes to the ground. That is, the slot to accommodate the tang is modified to be at an angle. 5c) The snath’s bottom surface can be modified by cutting out a thin angled wedge shape. The Scythe Connection site discusses this approach here. The wedge is not modified. 6) To increase strength of attachment use a hardwood wedge and/or increase the thickness of the bottom side of the wedge. 7) Do not hammer in the small side wedge(s) (that help lock the haft angle) too severely, otherwise the main large wedge could be split. 8) It is possible to avoid the use of one or both of the small side wedge(s) if the bolt holes for the forward "clamp" are judiciously chosen. That is, if they can be placed adjacent to the snath on each side.